Seamen relaxing on the Pallas, Gabriel Bray, 1774, National Maritime Museum. Though most of Bray's works are unsurprising in their depictions of dress, there are the odd ducks. The last image I posted was of a marine and sailor wearing odd fur caps and what appear to be vambraces. This is another odd piece. A sailor leans back against a line to relax, while his mates sew in the background. The first thing that I noticed in this image is the very long and tightly bound queue. A vast majority of images of the time show sailors with short hair. Occasionally they will have side curls, but most do not have queues. This proves definitively that sailors could and did wear their hair longer than many popular representations show. As to how common this actually was, it is difficult or impossible to say. The other odd bit is his cap. It looks like a cross between an infantry forage cap and a light infantry cap of the French and Indian War. With a red brim bound in white tape around a black crown, I have to say I've never seen anything quite like it. Another notable feature of the sailor at the center is his blue and white checked shirt. Few images show this, but it is perhaps more common than we know. 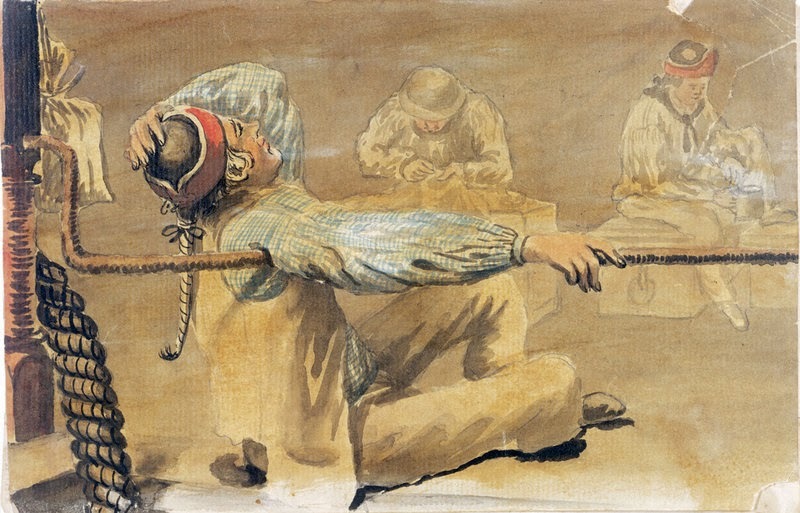 Other lower class laborers are known to have worn similar patterns on their shirts, so it wouldn't be unreasonable to assume sailors did as well. His waistcoat is a plain white with slash pockets at the waist, and his trousers are white as well. Behind him and to the right is a jack in the same cap, with a black neckcloth, white shirt, and white trousers. To his left is a tar in the same slop clothes, but wearing a round hat. This image is an important reminder that we don't have all the answers. As much as we may examine the sources available to us, we have to recognize that not all sources are available. The passage of time means the destruction and loss of countless written, physical, and visual sources, not to mention the memories of those who lived at the time. Strive as we might to capture an understanding of an era, we have to acknowledge that our understanding will be incomplete. EDIT: When I first started this blog, I did not rely on catalog entries for the images I collected, or at least not as much as I should have. Adam Hodges-LeClaire pointed out that the caps are typical of British marines, and the National Maritime Museum's assessment is in agreement with him: "From his apparent headgear the seaman shown and the man seated on a sea chest with a tankard in his hand, far right, are probably Marines." We can reasonably conclude that the fellow sewing in the background with the round hat is a sailor, but the others should probably be regarded as marines.